Yes! - More Ladies of Aâtiphone! Do not mess with these badass âouiniyat ladies, who come to you straight outta 1990s Marrakech armed with bendir-s, târija-s, and non-stop rhyming couplets, to rock you all night long. Just fire up a pot of mint tea, set out a tray and some glasses, and when the groove takes you, get up and shimmy to your heart's content. 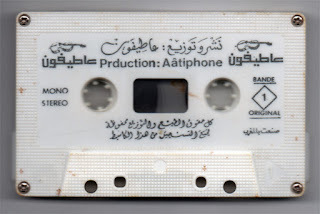 As I've said before, everything I've ever heard on the Âatiphone imprint out of Kelaat es-Sraghna is super-great, and this tape is no exception. Enjoy!